I made myself a little present this christmas by putting a Karotz under my christmas tree. 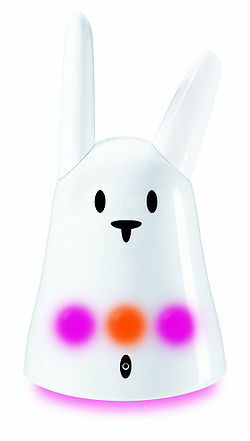 This little digital bunny robot is the 3rd generation of a gadget that was once known as Nabaztag. Karotz can connect to the internet and you can deploy applications on it. It’s a tiny multitalent, speaks, blinks, turns his ears, takes photos and plays musik. The really cool stuff about all this, is that you can also access it via a REST-api. I was a little disturbed by the bad documentation of the api, but since Karotz has had a pretty shaken history, I was willing to see over it. Nevertheless I had a really hard time figuring out how to use the API, especially the interactiveMode sessions, which are crucial for interacting with Karotz. That’s why I wanted to give you a short HOW-TO wrapup on it. First of all you need to have a Karotz up and running, like it’s described in the handbook. Register yourself at karotz.com and click on the lab button at the bottom of the page. Once you registered yourself for all the developer stuff, you need to register a new application for yourself in order to get access to the credentials needed to talk to Karotz. Have a look at this Christops Blog if you don’t get it working for yourself. This will rotate Karotz ears, blink the LED, say ‘test’ and let it play the A-TEAM theme!